Opening in 1961, RFK Stadium became the first multipurpose stadiums ever built. By the early 1950s, Griffith Stadium, home of the Washington Redskins (NFL) and Senators (MLB) was beginning to show its age. The time had come for a new stadium to be built in the nation’s capitol. By the mid 1950s city leaders decided to build a multipurpose stadium that could host both football and baseball. Construction on the stadium began in 1959 near the Anacostia River. Completed in just over two years, the facility was originally known as D.C. Stadium. The Washington Redskins played their first game at D.C. Stadium on October 1, 1961 in front of only 36,000 fans. D.C. Stadium could seat more than 56,000 fans for football. Two tiers of seats enclosed the entire field. By 1969, the facility was renamed RFK Stadium in honor of Robert F. Kennedy. The Washington Redskins shared RFK Stadium with the Washington Senators (MLB) for ten years before the team moved to Texas. Throughout the years, RFK Stadium changed very little with the exception of the seats being replaced. By the late 1980s, owner of the Redskins, Jack Kent Cooke began lobbying for a new stadium for his team. RFK Stadium lacked many amenities that newer stadiums had such as luxury suites. 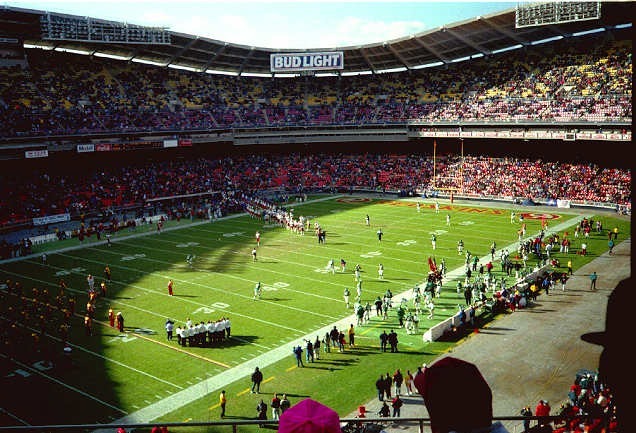 By 1996, construction on a state of the art stadium in Landover, MD begun. The Washington Redskins played their last game at RFK Stadium on December 22, 1996 against the Dallas Cowboys. The following year the team moved into FedEx Field. For three seasons, 2005-2007, the Washington Nationals (MLB) played at RFK Stadium before moving to their new ballpark in 2008. Today the stadium is the home of the DC United soccer team.